Along with being the author of Walk With Me (forthcoming September 2012, River North/Moody), my fiction has been published in numerous journals including Image, The Southern Review and The North American Review and included in the anthology series, Not Safe But Good, edited by Bret Lott and published by Thomas Nelson. I’m also the author of a young adult novel, The Counterfeit Collection (Tyndale) and I’ve written feature articles for many publications such as Guideposts, Leadership, and Partnership. Before writing full-time, I worked in book publishing as an acquisitions editor and then as Editor-in-Chief at Princeton University Press. Since 2000, I’ve lived in Morocco where my husband is the pastor of Rabat International Church. We have two married daughters and four delightful grandchildren. On the Myers-Briggs scale, I’m not an I for introvert. I’m an H for hermit. I love Easter sunrise services in cemeteries. I live on the west coast — of Africa. My favorite Moroccan meal: Zahara’s beef couscous with raisin sauce, and tchouchouka. I once told God I’d marry anyone except the man who became my husband. I prefer to make things up rather than do research, although I have been described as an ‘infomaniac’. 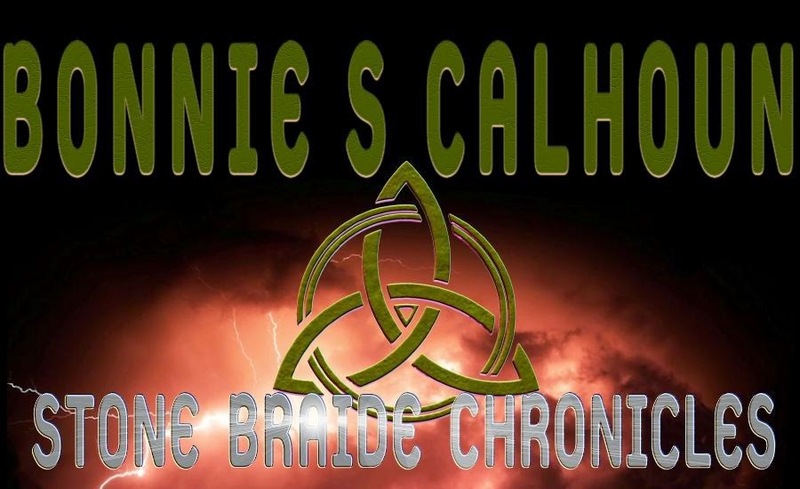 Peter and Celeste choose to travel as one on the lifelong journey to the King's City. They are blissfully in love and bound to each other by the Cords of Commitment. or visit the Valley of Cut Cords to journey alone once more. 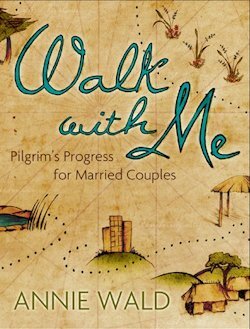 If you'd like to read a chapter excerpt of Walk with Me, go HERE. 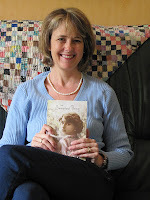 Elizabeth Musser, author of acclaimed novels such as The Swan House, grew up in Georgia, but now lives in Lyon, France, where she and her husband serve as missionaries with International Teams. Look for Two Testaments, her sequel to Two Crosses, in stores now, and Two Destinies, the third book in the trilogy, set for release in Fall 2012. 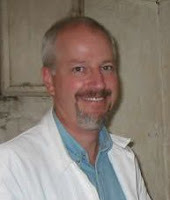 Recent exciting news is that, finally, the whole trilogy is going to be published in 2012. Many readers have written to me throughout the years to encourage me to keep pursuing getting Two Destinies into print. In a fun twist of fate (really the Lord's perfect timing), David C. Cook (who originally published Two Testaments) has offered me a contract for all three novels. The Secrets of the Cross Trilogy will be published in June 2012 (Two Crosses and Two Testaments) and in September, 2012, Two Destinies will be in the bookstores for the first time! Now 1994, France faces unrest and rising poverty while neighbor Algeria is in the midst of a blood civil war. Risléne Namani, a French woman born to Algerian parents, converts to Christianity and falls in love with Eric Hoffmann, a Christian, committing the unpardonable sin in the eyes of her Muslim family. Eric must find a way to rescue her—from a forced marriage in Algeria, or even death. 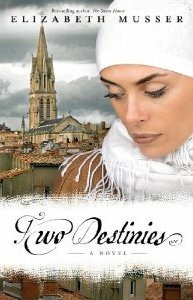 If you would like to read the first chapter excerpt of Two Destinies, go HERE. It's been fifteen years since Gideon Miller ran away from his Amish community in Carlisle, Pennsylvania as a boy of fifteen. Gideon arrives in the Smoky Mountains town of Twin Branches and settles in at the local auto mechanic's garage. He meets a host of interesting characters -the most recent acquaintances are Kiki, an autistic teen, and her sister Mari. Known as the "Getaway Savior" he helps other Amish boys and girls relocate to life in modern America. One day the phone rings. On the other end is his brother Moriah calling from Florida. Of course Gideon welcomes his brother to stay with him and offers him a job. But Moriah is caught in a web which ends in his death and forces Gideon to return to the town of his youth, with his brother's body in the back of a hearse and Mari and Kiki at his side. He must face not only the community he ran away from years ago but also his own web of bitterness. Will he be able to give his anger over to God and forgive his father? 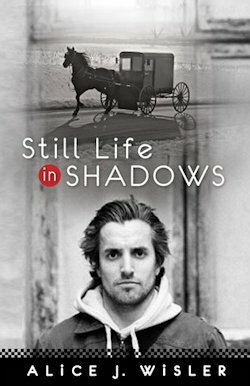 If you would like to read the first chapter excerpt of Still Life in Shadows, go HERE. When a brilliant surgeon undergoes a heart transplant, her life transforms as she begins experiencing memories of a murder she never witnessed. The residents worship her. Nurses step out of her way. Her colleagues respect and sometimes even fear her. But surgeon Tori Taylor never expected to end up on this side of the operating table. Now she has a new heart. This life that was formerly controlled and predictable is now chaotic. Dr. Taylor had famously protected herself from love or commitment, but her walls are beginning to crumble. And strangest of all, memories surface that will take her on a journey out of the operating room and into a murder investigation. Where there once was a heart of stone, there is a heart of flesh. And there is no going back. 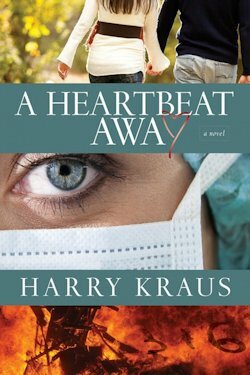 If you'd like to read the first chapter excerpt of A Heartbeat Away, go HERE. Jody has written novels for the last 20 years (with a hiatus when her children were young). 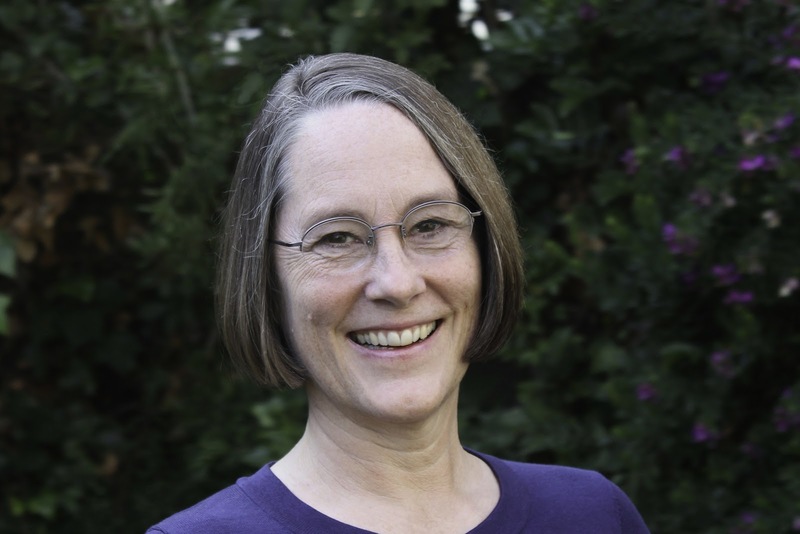 After many years of writing and honing her skills, she finally garnered national attention with her double final in the Genesis Contest, a fiction-writing contest for unpublished writers through ACFW (American Christian Fiction Writers). Her first published book, The Preacher’s Bride (2010 Bethany House Publishers), became a best seller and has won multiple awards. Her second book, The Doctor’s Lady, released in September of 2011, and her third book, Unending Devotion, is out now. She’s currently busy researching and writing another book! Jody has been married for twenty years to her college sweetheart. Jody has five children ranging in ages from 15 to 6, with a set of twin daughters in the mix to make things more lively. In 1883 Michigan, Lily Young is on a mission to save her lost sister, or die trying. Heedless of the danger, her searches of logging camps lead her to Harrison and into the sights of Connell McCormick, a man doing his best to add to the hard-earned fortunes of his lumber baron father. Posing during the day as a photographer's assistant, Lily can't understand why any God-fearing citizen would allow evil to persist and why men like Connell McCormick turn a blind eye to the crime rampant in the town. But Connell is boss-man of three of his father's lumber camps in the area, and like most of the other men, he's interested in clearing the pine and earning a profit. He figures as long as he's living an upright life, that's what matters. Lily challenges everything he thought he knew, and together they work not only to save her sister but to put an end to the corruption that's dominated Harrison for so long. If you would like to read the first chapter of Unending Devotion, go HERE. If you would like to read the first chapter of The Bridesmaid, go HERE. Since 2000, Shelley Sabga has sold over thirty novels to numerous publishers, including HarperCollins, Harlequin, Abingdon Press, and Avon Inspire. She has been interviewed by NPR, and her books have been highlighted in numerous publications, including USA Today and The Wall Street Journal. 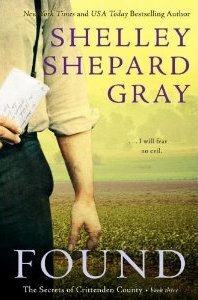 Under the name Shelley Shepard Gray, Shelley writes Amish romances for HarperCollins’ inspirational line, Avon Inspire. Her recent novel, The Protector, the final book in her “Families of Honor” series, hit the New York Times List, and her previous novel in the same series, The Survivor, appeared on the USA Today bestseller list. Shelley has won the prestigious Holt Medallion for her books, Forgiven and Grace, and her novels have been chosen as Alternate Selections for the Doubleday/Literary Guild Book Club. Her first novel with Avon Inspire, Hidden, was an Inspirational Reader’s Choice finalist. Before writing romances, Shelley lived in Texas and Colorado, where she taught school and earned both her bachelor’s and master’s degrees in education. She now lives in southern Ohio and writes full time. Shelley is married, the mother of two children in college, and is an active member of her church. She serves on committees, volunteers in the church office, and currently leads a Bible study group, and she looks forward to the opportunity to continue to write novels that showcase her Christian ideals. 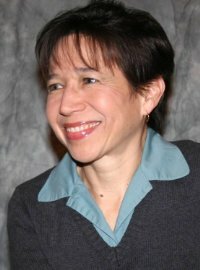 When she’s not writing, Shelley often attends conferences and reader retreats in order to give workshops and publicize her work. She’s attended RWA’s national conference six times, the ACFW conference and Romantic Times Magazine’s annual conference as well as traveled to New Jersey, Birmingham, and Tennessee to attend local conferences. A murder is solved and a quiet Amish community must deal with the repercussions. Amid the surprising revelations, can a newfound love survive? As the search for Perry Borntrager's killer continues, Jacob Schrock feels like his world is about to crumble. Right before Perry went missing, he and Jacob got into a fistfight. Jacob never told anyone what happened that terrible night. He's good at keeping secrets—including his love for Deborah, Perry's sister. But when Deborah takes a job at his family's store and their friendship blossoms, Jacob senses everything is about to be revealed. Deborah has been searching for a slice of happiness ever since her brother's body was discovered. When the police start questioning Jacob, Deborah can't believe that the one person she's finally allowed in could be the one responsible for her brother's death. Will she believe what everyone seems to think is the truth . . . or listen to her heart, and hope there is still one more person who is keeping secrets in Crittenden County? If you would like to read the first chapter excerpt of Found, go HERE. Jordyn Redwood has served patients and their families for nearly twenty years and currently works as a pediatric ER nurse. As a self-professed medical nerd and trauma junkie, she was drawn to the controlled chaotic environments of critical care and emergency nursing. Her love of teaching developed early and she was among the youngest CPR instructors for the American Red Cross at the age of seventeen. Since then, she has continued to teach advanced resuscitation classes to participants ranging from first responders to MD’s. 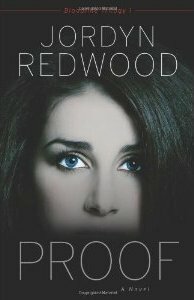 Her discovery that she also had a fondness for answering medical questions for authors led to the creation of Redwood’s Medical Edge at http://jordynredwood.com/. 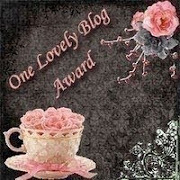 This blog is devoted to helping contemporary and historical authors write medically accurate fiction. Jordyn lives in Colorado with her husband, two daughters, and one crazy hound dog. In her spare time she also enjoys reading her favorite authors, quilting, and cross-stitching. If you would like to read the first chapter of Proof, go HERE. Ruth knew she wanted to be a writer ever since she wrote her first story--a spy thriller--at the age of twelve. She studied comparative literature at Smith College, spending her junior year at the Sorbonne in Paris. After college, she taught English in the Canary Islands then worked in international development in Miami, Florida, before moving to the Netherlands, where for the next several years, she juggled both writing and raising her three children. 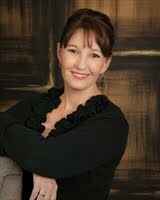 In 1994, her second manuscript was a finalist in Romance Writers of America's Golden Heart competition. In 2002, her sixth manuscript took second place in the Laurie Contest of RWA's Smoky Mountain chapter. The final judge requested her full manuscript and this became her first published book, Winter Is Past, which was spotlighted in Christian Retailing magazine. 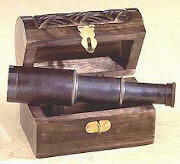 Since then, Ruth has gone on to publish thirteen historical romances and one novella. Her books have been translated into Dutch, Italian, Polish and Afrikaans . Her second historical, Wild Rose, was chosen by Booklist as a "Top Ten Christian Fiction" selection in 2005. Ruth lives on the coast of Maine where she enjoys gardening, walking, reading romances and gazing at the ocean plotting her next romance. Esperanza Estrada, daughter of a Portuguese immigrant fisherman and a local woman, lives on the wrong side of town, surrounded by a brood of brothers and sisters and a careworn mother. She is unable to pretend she is anything but "one of those Estradas." When she overhears of a position to clean house at a local high school teacher's home on Elm Street, she jumps at the opportunity--to be able to run into Warren Brentwood now and again, but also to imbibe of the culture and intellectual atmosphere of the Stocktons. When rumors about Espy and her respected employer begin to circulate, the entire church congregation and then the community pronounce judgment on her behavior. Warren believes the lie and his loss of faith in her causes Espy to give up without a fight. She leaves her family and hometown for the nearest city with little money and no acquaintances and is forced to spend the night on the street. A man who heads a mission for the homeless finds Espy and offers her shelter. Espy finds the true love of God while working at the mission. Will she be able to forgive the townspeople and return home? If you would like to read the first chapter excerpt of Her Good Name, go HERE.